Last month, Bay Club members gathered and welcomed fellow member Jeannie Smith as she spoke about her five-year experience as a bee keeper. 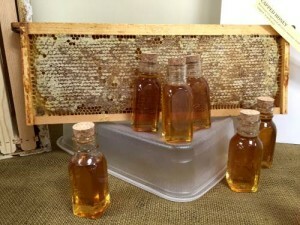 The lecture, “The Miracle of Bees: Honey Bees 101,” highlighted Jeannie’s own honey bees and four hives. She shared her extensive knowledge of the bees by helping listeners understand the role they play in their hive community along with information about bees in general. The evening also featured a honey-themed cocktail and snack concocted by the Golf House team. The cocktail, “Jeannie’s Honeybee Sweet Tea” and Finikia, George’s Greek Christmas cookie, were both made using honey from Jeannie’s hives and were very highly praised throughout the evening. We also want to welcome the newest family to move into the Bay Club – a hive of 15,000 honey bees. 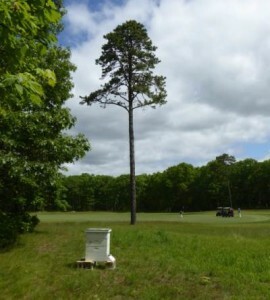 Situated on a knoll well to the left of the 11th hole, the hive is the latest addition to the Bay Club’s commitment to protect and promote ecological diversity. Although the resident honey bees are very gentle, the hive should not be disturbed as it goes about its task of pollinating the flowers and making honey to be shared with the chefs in our kitchen.